Ranked 3rd among the Engineering Institutions in Tamil Nadu in “Teaching, Learning and Resources” by National Institutional Ranking Framework (NIRF), MHRD. Ranked No.15 among the Private Engineering Institutions in India by NIRF. Track record of 32 years of Excellence in offering Engineering, Science and Management programmes. B.S. 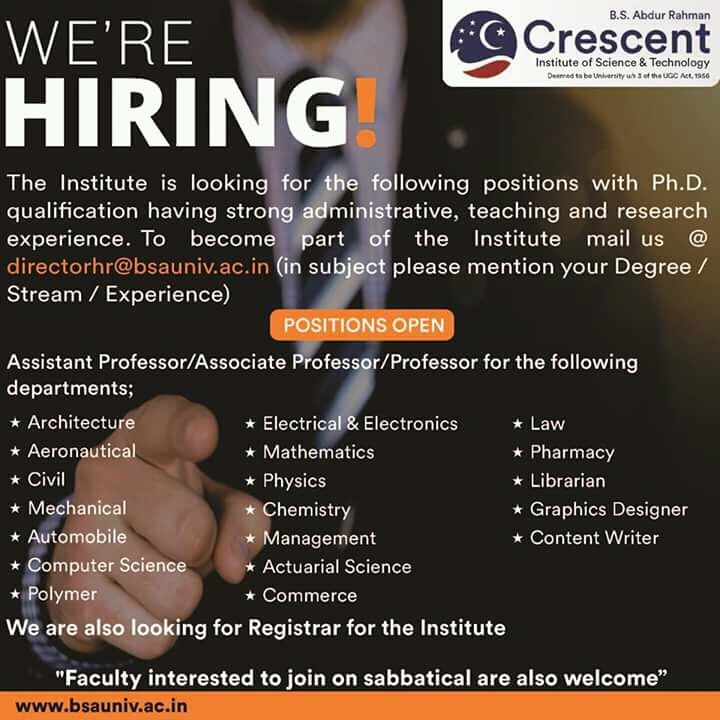 Abdur Rahman Crescent Institute of Science & Technology ,Vandalur, Chennai-600 048, (formerly B.S. Abdur Rahman Crescent Engineering College) has been established under section 3 of the UGC Act 1956. The institution is located in the outskirts of Chennai city on the G.S.T. Road, (Chennai-Trichy National Highway) 7 km from Tambaram and 2 km from Vandalur Railway Station and 17 km from the International Airport. Being adjacent to the Arignar Anna Zoological Park, it is easily accessible by city buses. B.S. Abdur Rahman Crescent Engineering College, which has now been upgraded as B.S Abdur Rahman Crescent Institute of Science & Technology Deemed to be University, was an institution acclaimed throughout India for its quality in teaching and research. Being one of the largest engineering institutions in India, it lays emphasis on innovative research, investment in high-quality facilities and first-rate infrastructure. By making use of the latest technologies and quality teaching, the college is able to offer a wide choice of interdisciplinary degrees in engineering which has enabled students to gain accolades in the global level. It is one of the few institutions with all the UG and PG programmes approved by AICTE and accredited by the National Board of Accreditation. This has been upgraded to university status with a view to keep academic in pace with development in industry. Modern hostel facilities are available for men and women students separately within the institution campus.